Camp Viking is a campsite with 40 touring pitches and 3 year round pitches. 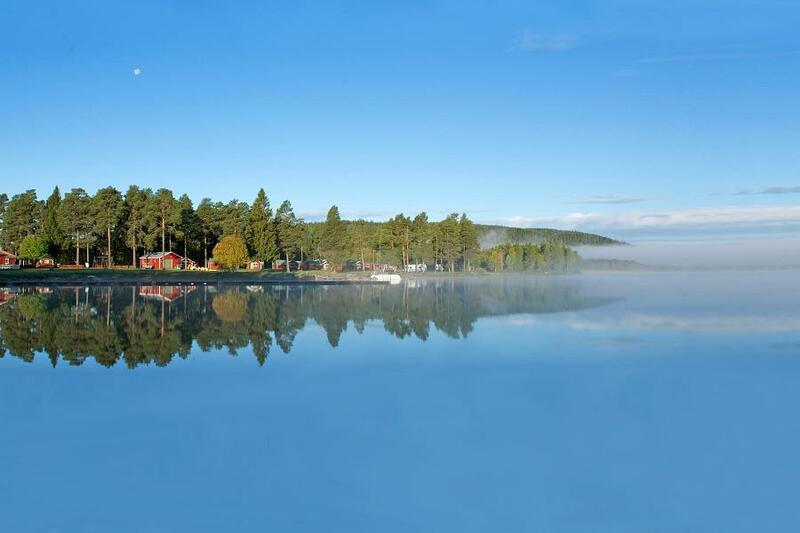 During low season, between 01-01-2019 - 15-06-2019 and 01-09-2019 - 31-12-2019, the nightly rate is €20,- at one of the 40 touring pitches at Camp Viking in Gällö (Jämtland). At this campsite you can not only use your CampingCard ACSI for inexpensive camping, you can also use your ACSI Club ID (as an alternative ID). Viking Camp is centrally located in Sweden. Accessible from Sundsvall by car, bus and train. From the campsite you have a view of the Revsundssjön. You can go hiking, biking, fishing, canoeing in the area or just sit in front of your motorhome, caravan or tent. In short, a must do in Sweden. Neues und sehr schön gestaltetes Servicehaus, sehr gute Ver- und Entsorgungsstation. Wir haben uns auf dem Campingplatz mit toller Lage am See sehr wohl gefühlt. Das war vom Süden her der schönste ACI Camping. Alles neu die Küche die Duschen mit Glas Wänden und die WC alles neu. einfach mega super toll. Wir sind als Paar am 3.6.2018 hier . Angenehmer, gepflegter CP in sehr schöner Lage direkt am See. Freundlicher Empfang. Sanitär ordentlich. Wir würden wiederkommen. Would you like to book Camp Viking or request more information? You can do both using the information below. On the E14, coming from Sundsvall towards Östersund, just before Gällö, after the petrol station on the right, you will find the entrance to the campsite. CampingCard ACSI will send your information request to "Camp Viking".